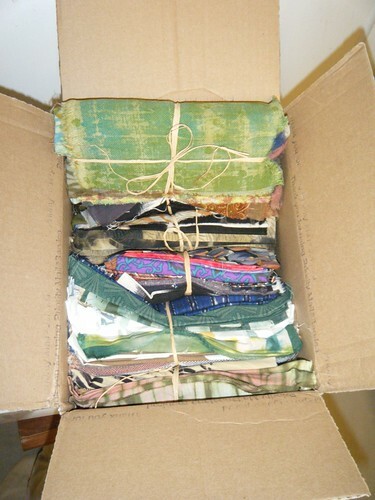 One of the things that’s different with ABOL is that yes, people are sending sewing patterns. But what kind? What works, what’s best? Well, take a look at this photo, and I’ll see if I can explain. 1. If you want to include a sewing pattern, like this photo, it does’t have to be the prettiest thing ever. 2. And like this photo, it can be a guy thing. It’s universal – people sew and make clothes for a bunch of reasons, utility still being on that list. 3. See any bi-focals on that guy? At his age, he’s obviously not ready to read anything. Assume the same with patterns. Good pictures will go a long way, and simple patterns not reliant on reading are idea. Literacy is out of the norm. 4. Look at that sleeve. Two ball points, and a Sharpie. Egads, that’s a horrible set of tools. What can one make with that? Well, the answer is, not much. But for most of the folks on the other end, it’s going to be simple sewing with simple tools. 5. See the photo bomber? Well, the CST has been running sewing classes when they can, and they’re interested in doing more. So, if all goes well, there will be someone looking over their shoulder. Just hopefully not in a creepy manner, like the ad on the wall here. 6. That’s a pretty universal outfit in the photo. 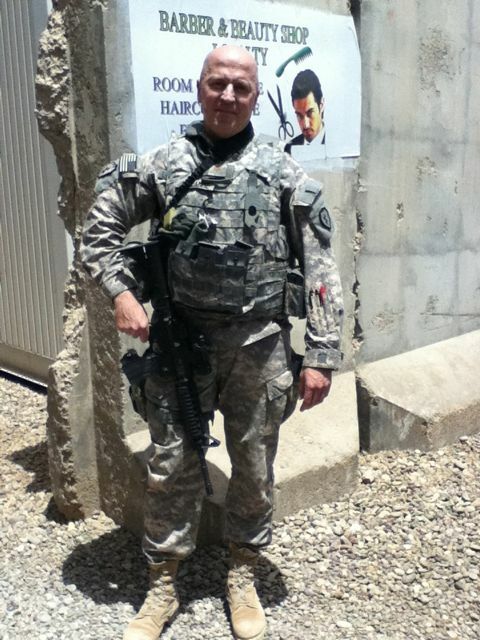 Young and old, men and women in the US Army wear that garb. Most folks still tend to wear the salwar kameez, which has pants like pajamas and a basic tunic-style top, and is worm by men and women. The colors and fabric selection probably make the difference there. 8. Think about patterns that support both light and heavier fabrics. 9. And thankfully, it’s not revealing. I get a lot of emails about IBOL. Sometimes, it’s small talk. Sometimes, it’s about loved ones who are deployed. Sometimes, it’s about things like what to use as a phone number on the customs form (for which there is no good answer, by the way). A 37 pound bundle of love. Wow. That’s one heavy bundle! I also had a wonderful comment, when someone said that started by figuring out what they’d want to receive as a starter kit, and then going into their stash and digging out those kinds of things. That just struck me as being awesome — making the kind of bundle you wished you were receiving. So, keep ’em coming. I am fairly sure I am all caught up on comments and sending out the address, as of…. right this second. If I wait 3 minutes, there will be another comment, for sure. IBOL Sundae is almost here, and that means that the 8th is just around the corner. Just a few more days to package up the bundles and get them into the mail. Over this long holiday (in America) weekend, if you’re looking for some more light reading, take a peak at this. It’s a Google search of sites out there that have linked back to IBOL. In it, you’ll find all kinds of quilters and knitters, crafters and dreamers. Some say little more than “OMG, go see IBOL!” but others write at length about IBOL, their bundles, and the process of being involved in this. And, worst case, you may find a link or two to an artist whom you’re not familiar. Right now, it’s got 126 leads for you to follow and explore. That should provide you with some entertainment for a while, I would hope. So, 26 bundles have arrived. Today brought the first YARBOL — yarn bundle of love. And I have to ask — how does my stash compare to yours? I think this stash is AWESOME. And I need to show you one more bundle. It’s the anti-bundle. It arrived….. naked. Can you see those? The fabric is truly spectacular. Opening the box, my first thought was, Someone could part with this? I’ll grad something and bundle it up in the next couple of days – probably after I get to stare at it some more. Oh, and before I forget — my room has that wonderful smell of fabric. Which is much nicer than its normal smell of running shoes. All I need now is a cat to sleep amongst the bundles, and all would be right in the world. And relax — there’s plenty of time still. The mailing deadline isn’t until 07 September — weeks away! Go play in your stash, rummage around and bit. On this quiet Sunday morning, I thought I’d try and wrap up a few loose ideas and other things. 1. Thanks. Holy smokes, THANKS. I really thought that success for this project was going to be measures in tens, not hundreds. My units is trying to figure out where to put all these bundles until we start making deliveries — and yes, this is a marvelous problem to have! 2. Yes, by all means — I am totally OK with you giving the mail address to people. I ask a couple of things — a) I am trying to keep the actual address off of the web, since this thing only runs for so long (and since I leave not long after it ends), and 2) you pass along that stuff should be post-marked by 7 Sept. I think that probably applies for international mail, too. If you’re on Palau, well, I’d send stuff sooner rather than later. 3. Has anyone convinced their local fabric / yard place to support this by selling stuff at cost (or darn tootin’ cheap)? Please let me know. I would love, love, love to find a fabric / yard place doing this. It’s gotta be possible, right? 4. What if that store had local volunteers who built actual bundles? And took Visa? Suddenly, the non-quilting / knitting people of the world — stop laughing! They really do exist! — would have an easy way to pile on board, too. I could soooo sell that idea to nerds. And to people to go to sock week dressed as Darth Vader. And rock stars. The rest of the world. 5. Jacquie posted some wonderful eye candy about what she’s sending (here), and in the comments, Rachel made what was probably a tongue-in-cheek offer to send 20 yards for fabric in exchange for one of the pieces heading her way instead. Which might actually happen. Which got me thinking — one yard becomes 20? Really? How else is this thing mutating in weird, wonderful ways? 6. There’s a Flickr tag for this whole thing: iraqibundlesoflove. 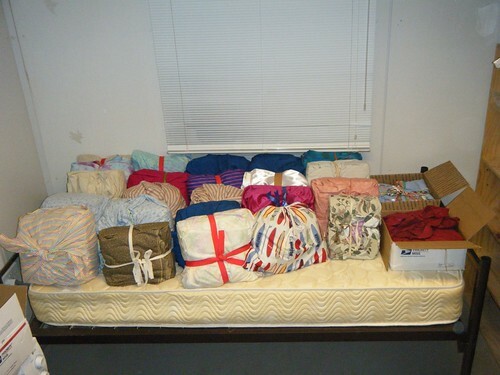 Over on Facebook, I am linking to some of the many photos of bundles that people are posting to the web, mostly on their own websites. And I gotta say — wow, they are stunning. And very popular with the cats, since they seem to be almost magnetically attracted to these bundles, too. Probably because the bundle represents a pile that they can either 1) sit on, or 2) barf on. 7. Fans of the blog Happy Zombie might want to swing by JoCo‘s site here and download the zombie song. Yes, it’s legal to download this (even in the US), and yes, it’s free. 8. The first day this site was up, 10 people visited. And I bet they all shared the same family name as well. And Google returned no results when you searched for the phrase Iraqi Bundles of Love. Friday, the site was hammered by just a hair under 2000 hits, and what seemed like 1000 people leaving comments asking for the address (Ok, it was probably just 50). There’s been a ton of visitors from the US and Canada. And Germany, my other home. And now some from Australia (!). And the UK. And Norway. It warms my heart plenty to have so many, from so many places, offer to help out this US Soldier. 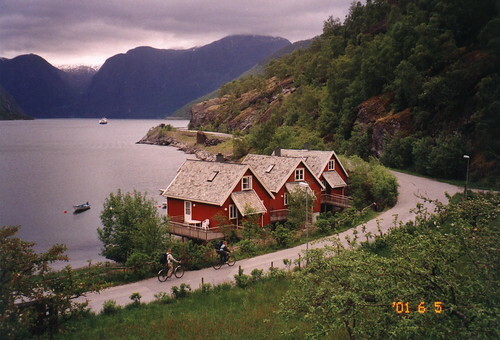 So, I will leave you with one of my favorite photos of all time, that I took in Flam, Norway, back when we were expecting IBOL Kid #2. Maybe it’ll warm our heart, too. And for the record, yes, you can now go do your part to stimulate the international economy by shopping for material to re-stock your stash. I am truly amazed at how the web has changed things. This entire effort is web based — I am in Iraq, writing to server that I assume is in the US, coordinating boxes to go to either NY or the Netherlands and on to me here. I am a bit worried about the number of boxes headed this way — there have been a TON of volunteers! So far, I’ve heard from the US, and Canada. Knitters, sewers, and quilters. Germany, and the Netherlands. Even the UK chimed in. Still no Romania, still no Australia. Still waiting on you, Australia. The question came up a while ago — who about folks in Europe? What about military folks overseas with access to MPS? Well, let me offer some options. If you live in Europe, but do not have access to the American military postal system (MPS), there is an easier way to do this, easier than mailing stuff to my APO address in NY only to have it come all the way back over the Atlantic to go to Iraq. Longtime friend Ken has been volunteered by his wife and SIL to receive boxes; he will turn around and put them into the MPS system to me. Contact me, and I will put you in touch with him. Fighting dwarves, I am talking to you. If you’re doing this, the size of the box does not matter. Send whatever size box you want. If you can, try and use plain boxes and small labels; Ken will either relabel the boxes, or wrap them in brown paper so they can go into the MPS system. Send a little, send a lot — postage will cost only as much as sending the stuff to the NL. If you are in Europe and have access to MPS, just pick a box, any old box, and send it straight to me via MPS. If you use one of the USPS boxes (they are good, strong boxes, after all), you will have to wrap it in brown paper before you try and send it; otherwise, the USPS will want to charge you the $12 to send it. I say, just pick a big box (a copier paper box? ), fill it, and send it — as long as it’s within length / width limits, and less than 70 lbs, yo are good to go. People who work at crafts centers, I am talking to you. And Ken, thanks. I will do my best to muster 48000 boxes. That’s love, man, that’s love. You might need to go buy a new car or something.